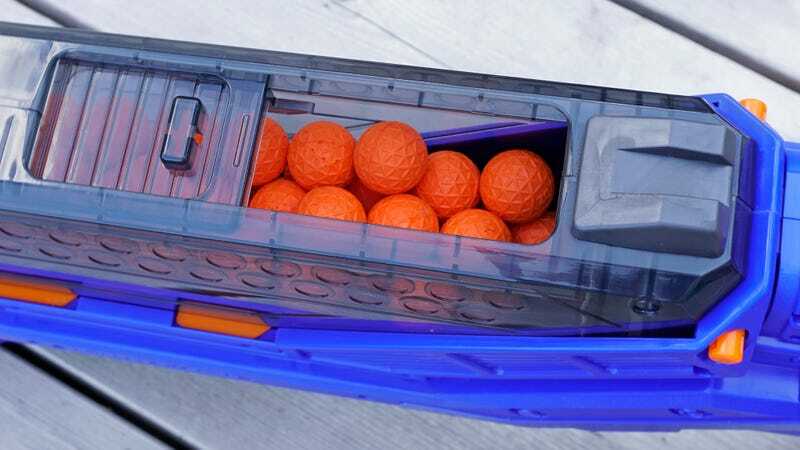 Nerf ranks up there with Lego, Hot Wheels, and Barbie, as one of the most recognisable brands in the toy industry, but can you have just as much fun pinging your co-worker with foam ammo fired from one of its competitor’s products? I went hands-on with two Nerf alternatives: the Adventure Force Commandfire and Quantum, and discovered a much cheaper way to wage a friendly battle. 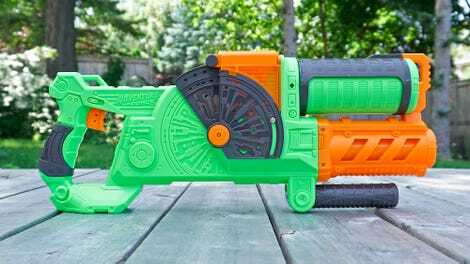 You’ve probably seen Nerf’s competition in toy stores before, and more than likely you’ve always assumed that paying a bit extra for the more recognisable brand guaranteed a better play experience. I’ve certainly been guilty of that, but as someone who tests gadgets and toys for a living, I’ve also been pleasantly surprised by products from lesser known brands. Modern design and manufacturing processes have made it easier for smaller companies to compete with giant corporations, and while it’s not hard to spot the compromises that allow these new Adventure Force blasters to undercut Nerf when it comes to price, they don’t cut corners when it comes to performance. 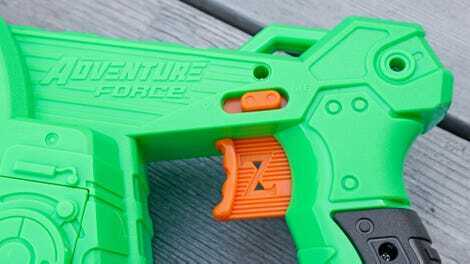 Although far from being a direct copy, the Adventure Force Commandfire offers similar functionality to Nerf’s N-Strike Elite Infinus blaster, which was introduced at Toy Fair 2018 earlier this year. 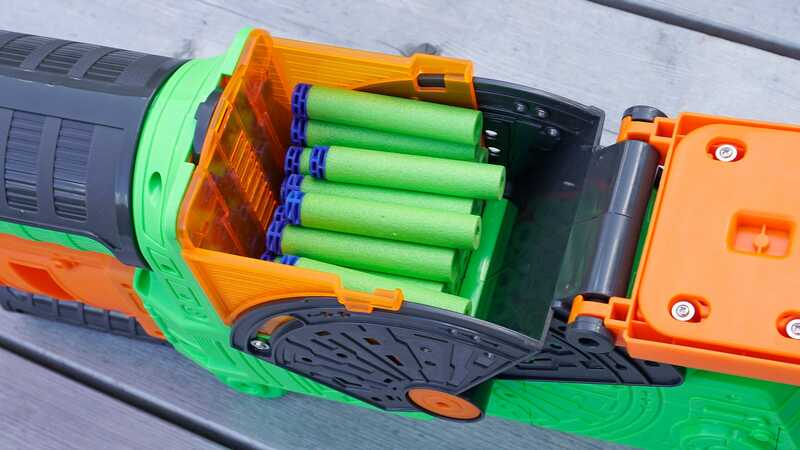 Both blasters have streamlined the reloading process, but while the Nerf Infinus has you stuffing darts into a funnel, one-by-one, the Commandfire instead lets you quickly dump a handful of darts into a 40-shot hopper. This is functionality you typically only see with the new wave of toy blasters that fire tiny foam balls, but here it works with darts, and works surprisingly well. As long as they’re all pointing towards the front of the blaster, you can drop a handful of loose darts into the Commandfire’s hopper and immediately start firing. Mind you, neither approach is perfect. For the Commandfire’s quick-fill hopper to work properly, you need to make sure all of the darts are aligned with their squishy tips pointing in the same direction first. A telescoping plate on the hopper’s lid drops down to ensure the darts are continuously pushed towards the automated firing mechanism at the bottom, but I also found you’ll still need to occasionally give the blaster a shake when darts get jammed and stop falling. Those complaints aside, it’s still a much better solution for quick reloads than having to buy, preload, and carry a bunch of swappable plastic magazines. 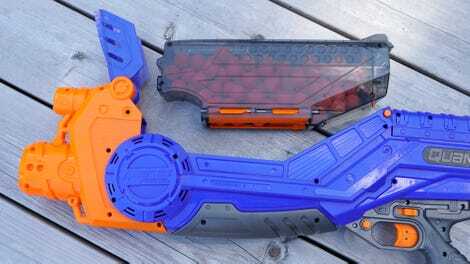 So why does Nerf’s N-Strike Infinus sell for $70 (£53) while the Adventure Force goes for $40 (£30)? The price difference becomes a little easier to understand when you hold the Commandfire. The plastics it’s made from feel lighter, and it occasionally takes a couple of tries to properly align and close the hopper’s lid. Nerf’s motorized blasters also use a double trigger system that only spins up the motors when you’re ready to fire, but the Commandfire instead employs a basic on/off switch that chews through batteries faster unless you’re constantly turning it on and off as needed. 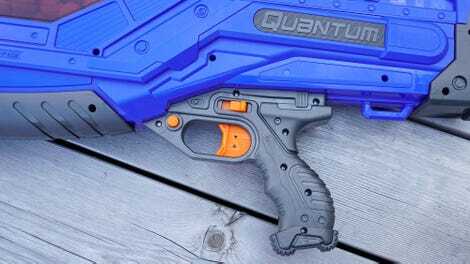 Nerf fans will undoubtedly find the design of the Adventure Force Quantum very similar to the Rival Nemesis MXVII-1oK, which has been around for about a year-and-a-half now. 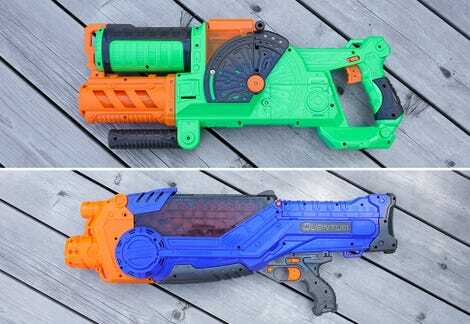 Both blasters feature removable hoppers that can hold over 70 small foam rounds (the Quantum is compatible with Nerf’s Rival ammo), they’re both powered by six D-sized batteries, and they both have a heavy and intimidating heft. But where the Nerf Rival Nemesis MXVII-1oK will set you back $100 (£76), at $50 (£38), the Adventure Force Quantum is half the price. The hopper can also be completely removed, allowing you to keep a fully-loaded backup nearby, or for dealing with jams in its automated firing mechanism. The Quantum can also be customised using a series of snap-on coloured discs that are included, making it easier to distinguish friend from foe in battle. When compared to the Commandfire, the build quality on the Adventure Force Quantum feels more solid, but it uses the same basic on/off switch for activating the motorized firing mechanism, which is disappointing. It’s positioned close to the trigger, but I found it difficult to flick the switch on and off with my free thumb. As a result, you’ll probably just be inclined to leave it running, which will, unfortunately, chew through the six D-sized batteries it runs on a lot faster. For $50 (£38), however, the Quantum is surprisingly impressive when you pull the trigger. With a full hopper you’ll get about three rounds every second, with great accuracy and consistency. That can also be attributed to the small foam balls it fires, which fly straighter and farther than darts do. But the firing mechanism inside the Quantum, a pair of counter-spinning flywheels, gives the balls a lot of kick. I tested it against the spring-loaded Nerf Rival Phantom Corps Hades XVIII-6000 blaster, and found that the Quantum consistently fired the foam balls faster and farther. Saving yourself several hundred pounds by buying a suspicious-looking 1Ph0ne from the back of someone’s trunk might not be the wisest idea. 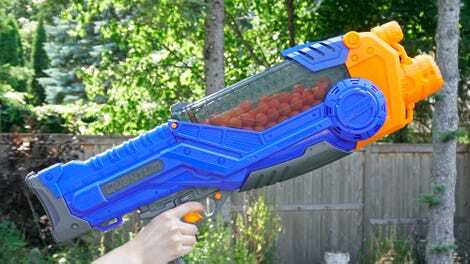 But unless you’re absolutely loyal to the Nerf brand, you can save yourself quite a bit of money, without compromising your fun, with these Adventure Force blasters.